This chapter proposes a model for predicting deformation response of deformable machines consisting of actively deformable materials. This is an attempt to understand activeness and deformability through description. The performance measure of the trial is simplicity and outlook of the model. We try to make up strategy to convert uncontrollable material into controllable mechanism. Soft materials that generate force and change shape can potentially form a basis for the development of deformable machines. Electroactive polymer gel is one of such promising materials. Most studies have focused on analyzing the material properties of the materials. It was not yet clear how to design effective shapes or to generate dexterous motions of mechanisms made of materials. It is difficult to apply the conventional models used to control rigid, articulated mechanisms for controlling gels because the material is too elastic and conceptually has infinite DOF. In this chapter, modelling framework is proposed that deals with activeness and deformability respectively, and describe a method for modelling each process. Previous models and proposed models are stated comparatively. Detailed evaluation and examination of the model are done in the next chapter and in the course of this book. 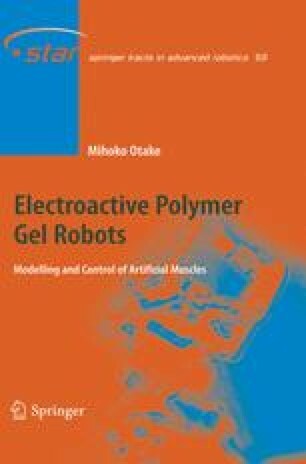 This chapter was adapted from in part, by permission, M. Otake, M. Inaba and H. Inoue, “Kinematics of Gel Robots made of Electro-Active Polymer PAMPS Gel”, Proceedings of IEEE International Conference on Robotics and Automation, pp.488-493, 2000; M. Otake, Y. Kagami, M. Inaba, and H. Inoue, “Dynamics of Gel Robots made of Electro-Active Polymer Gel”, Proceedings of IEEE International Conference on Robotics and Automation, pp.1458-1462, 2001; M. Otake, Y. Nakamura, and H. Inoue, “Pattern Formation Theory for Electroactive Polymer Gel Robots”, Proceedings of IEEE International Conference on Robotics and Automation, pp.2782-2787, 2004.